Are you exercising daily? Have you enrolled in one of my courses, started out super motivated and then after a week or a couple days or maybe even a day, left it and never returned? Perhaps you are still thinking you need to give your body alignment (posture) some attention, but you just haven’t started. Wherever you are at with your health regime, this post is going to have you finally succeed … but only if you finish reading and actually do what I suggest. AND, I promise, it will only take you 30 seconds. Are you willing to give 30 seconds a day to improve your posture? Great! I’m guessing 30 seconds is reasonable enough, for even the most persistent procrastinator. I love to read. Mostly I love to read non-fiction books on health, success, goals and personal growth – super geek alert! You can use these steps to create a new habit or change an unwanted habit. Duhigg recommends keeping the same cue and simply changing the behavior and seeing which leads to the greatest reward. As an example, I’m currently working on creating a new habit of getting out of bed 30 minutes earlier. My usual wake time is 7am. 6.30am rising leaves me with more energy (seems counter intuitive, but it’s true), gives me a sense of purpose and I find I’m generally happier. Those are my rewards. Let’s review the process. The cue is my phone alarm going off at 6.30am – and by the way, I leave the phone in the bathroom, so I have to get up to shut it off! Remember Duhigg suggests only adjusting the behaviors, while keeping the same cue. Getting up and going right into the shower – This worked quite well, but I prefer showing at night before bed, because I like getting into clean sheets with a clean body; AND I’m always cold in the winter, so love a shower to warm me up before bed. Reading – this one I really enjoy. I have a wee and then I cozy back into my warm bed (with Milo) and read. I did that this morning, but my eyelids were so heavy, I almost fell back to sleep. It also feels like a bit of a cheat! Dry skin brushing – this is my newest behavior choice. I used to skin brush regularly but have got out of the habit. Basically, the theory goes that brushing the skin (our largest organ) helps to rid the body of toxins, improving alertness and overall health. It’s a bit of a shocker first thing, but certainly does the trick waking me up! It’s early days, so I haven’t chosen the exact behavior I will settle on, but skin brushing is currently a good contender. Which ever one I choose, I already delight in the rewards of 6.30am rising. Basically, your brain is never going to tell you it’s fun to get up early, or to not eat chocolate cake, or turn off the TV to read, or go to the gym. You’re NEVER going to feel like it, so stop waiting for the right feeling and do it anyway! Stop waiting to feel motivated! Motivation comes from action. If you are waiting to feel motivated, you may be waiting a long time. Take an action; any action and watch the motivation grow. When you think of something you know you should do – calling your mother, paying a bill, going to the gym, making healthy soup or walking the dog – use the 5 second rule. Count down from five, four, three, two, one and be sure you begin to act within the five seconds or your brain will convince you not to do it. Act quickly to ride the action wave! Robbins explains that in order to cross a river, you step pebble to pebble or rock to rock, until you get to the other side. If you have a goal to lose 50 pounds, you need a plan. Grab a big sheet of paper and some colored markers. That is my go-to, when pebble planning. Choose a punishment – this is the answer to what if I don’t do it. Choose a pebble a day, or each week and do it! If you don’t do it, you need some sort of retribution. I’ve chosen my buddy Tara – she and I did pebble plans over beers at a Toronto distillery a couple weeks ago. We tell each other which pebble we are doing each week, and so far we are loving it. Robbin’s suggested reprimand is slightly brutal – but I like it! She suggests throwing $20 dollars out the window, when you are driving. Imagine how much that would hurt. Ouch! Currently I’m reading Mini Habits by Stephen Guise. It’s a tiny – read in one day – sort of book. It’s no masterpiece; he isn’t a great writer, but it’s a nice little winner. I’ve only read 50 pages and basically the science is simple. If exercising (or Posturecising) for an hour every day feels way to tough, then make it ridiculously simple. I’ve been saying this to my patients and students for years! Make it so silly simple, you can’t possibly fail. This is how I began Posturecising and creating a healthy daily habit for life. I now Posturecise without fail, every morning. If I miss a day, it’s no biggy, because I’ve neurologically wired it into my brain; so it’s easy to simply pick up again. Have you been struggling to create your own daily posture exercise routine? If you’ve already enrolled on one of my courses, great. At least you won’t waste time thinking about which exercise to do and in what order. 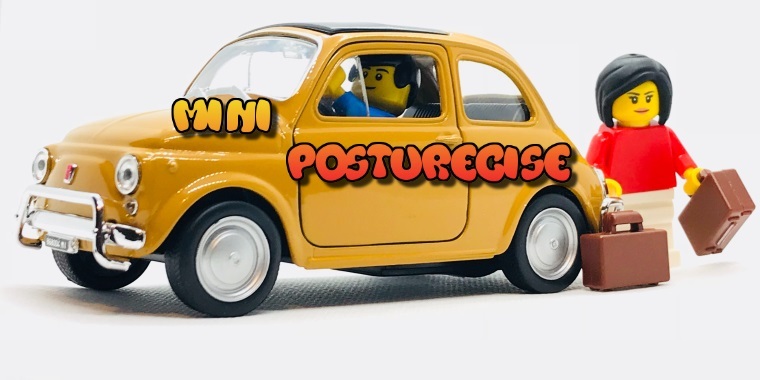 So if 30 lectures feels a little overwhelming, or working on your posture for 60 minutes daily, like a mountain to climb, then what you need is a new mini posture habit. A mini habit is just that – a super small, stupidly simply task. One you can not fail to complete. I’m guessing all of you could do the four mini tasks I listed above. You want to have good looking posture, am I right? Let’s break it down. Ideally I’d have you each completing my Posturecise program daily. But you’re struggling, or I’m guessing you wouldn’t still be reading. If I were to give you a list of exercises to choose from, you could pick the one most relevant to you. Or just choose the one that looks like the most fun. Take a look through the list – watch as many of the videos as you like, until you’ve chosen your exercise. Once you’ve selected your exercise, I want you to drop what you are doing, set the timer on your phone for 30 seconds and do the exercise for 30 seconds. Does that sound easy? It is! CONGRATULATIONS, you have a new mini Posturecise habit! What exercise did you choose?